MacVector 17.0 requires Mac OS X 10.9 or later. It will NOT work on Windows, Mac OS 9 or on Mac OS X 10.8 or earlier. The changes in MacVector 17.0.3 are described in the Release Notes . You can also read more about the new features in MacVector 17 on our What's New In MacVector 17? page. (a) If you have Administrative privileges to your machine, simply drag the MacVector folder onto the Applications folder and it will be installed for all users of the machine. 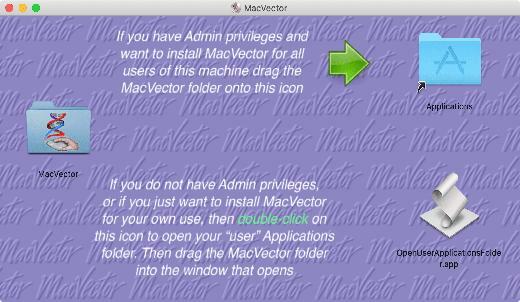 (b) If you do not have Administrative privileges, you can install, activate and run MacVector from your own personal home folder. Double-click on the OpenUserApplicationsFolder icon to open a separate window displaying the contents of that folder. Then drag the MacVector folder into the window to install for your use only. If you already have a valid license for MacVector with an active maintenance contract, MacVector will automatically recognize the license. 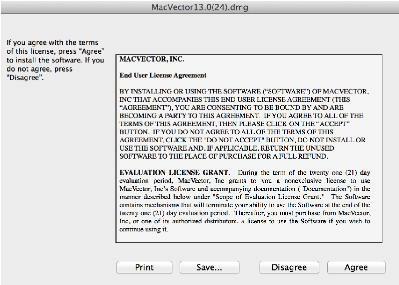 Otherwise, when you first start MacVector, a dialog will appear warning you that no valid license is installed. Click on the "Activate License..." button and enter the License Owner, Serial Number and Activation Code EXACTLY as they were sent to you. You have the option of installing the license for all users of the computer (requiring an Admin password) or just for your account, which can be done without needing administrative access. If you never received this information, first check your spam box, then contact sales@macvector.com. You must have a valid license to run this version of MacVector - your maintenance contract must have been active on November 1st 2018. If you get an error message that the installed license is too old to run this version of MacVector, and you are certain that your maintenance is current, you likely did not update your license activation code when you last renewed your maintenance contract. Please check your e-mail for an e-mail titled "MacVector Maintenance Contract Renewal" sent from support@macvector.com, or contact your IT support department if you are using an Institutional license. If you still cannot find the updated license code, please contact us at support@macvector.com including your serial number in the e-mail.